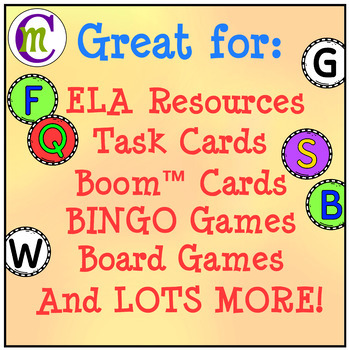 This alphabet coin clipart set is highly versatile and would be a bright addition to your ELA activities and resources such as task cards, BINGO games, BOOM™ Cards, board games, flash cards, and more! 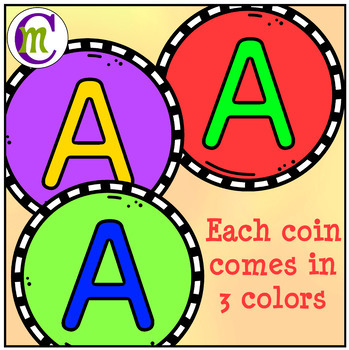 Included are coins from a-z (uppercase letters only) plus a blank coin in three bold color schemes. 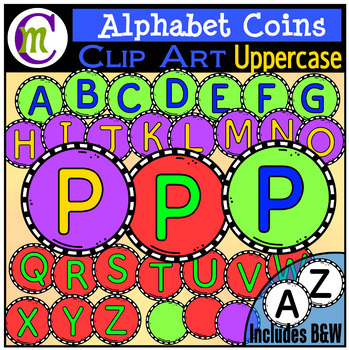 Black and white images of each are also included for a total of 108 images in this coin alphabet clip art set. 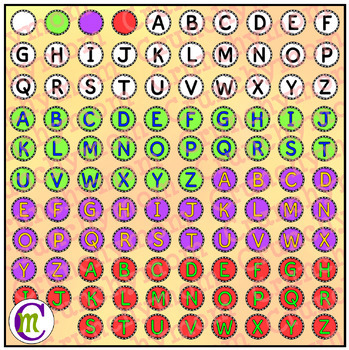 You can also find Lowercase Coins HERE. All pieces are high resolution 300 dpi PNG images on transparent backgrounds and can easily be layered into your projects and lesson materials. All Crunchymom graphics are protected under U.S. copyright law and the Digital Millennium Copyright Act (DMCA). All rights are reserved. When you purchase any of my graphics products, you are purchasing a SINGLE USER license and NOT the copyright to my images or products. ● Commercial use: Graphics may be used in commercial products, but MUST be flattened and secured if you use the images in products you sell (or distribute). Graphics MAY NOT be used to create other clipart or digital paper and MUST NOT be the main element in your product. Some examples of this would be classroom decor, binder covers, coloring pages, posters, or flash cards that do not add at least 50% of educational content to your overall product. ● Commercial credit is required: A link to the Crunchymom TpT store is required in both commercial products and freebies. A CM Logo image is included in the download file. ● You MAY NOT use my graphics for any commercial printing (stickers, pencil toppers, embroidery patterns, stamps, or any similar hard goods) without having written consent from Crunchymom. Images MAY NOT be used in products for sale on Etsy, Zazzle, or similar hard-product-based websites. ● Personal classroom use: Crunchymom graphics may be used however you wish personally in items that are not shared, distributed or sold. ● Blog/Website Usage: Images must be flattened and secured with other elements so they cannot be easily lifted and my CM Logo with a link to my store must be visibly displayed.